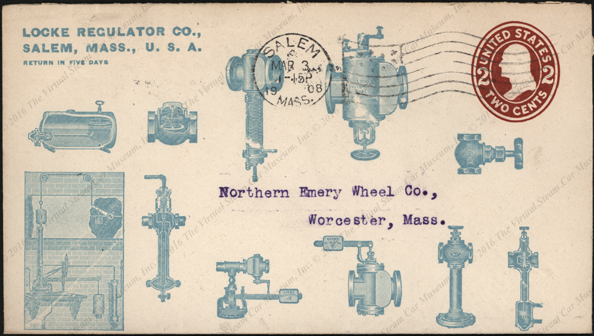 < Puritan Steam Car - Locke Regulator Co. The Locke Regulator Company was established in 1872. The Puritan steam car used a 6 hp 2-cylinder vertical engine and single chain drive, but among its more modern features were wheel steering (the column folded for easy access to the seats), and a foot throttle. 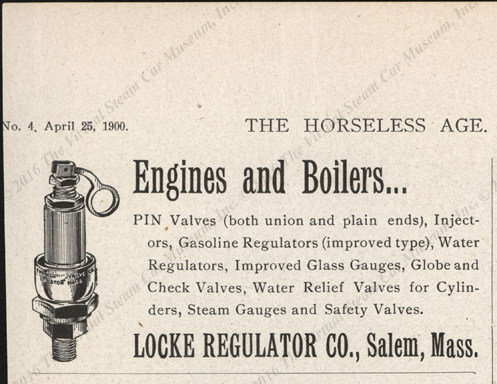 The Locke Regulator Company placed this advertisemnt in The Horseless Age on April 25, 1900. 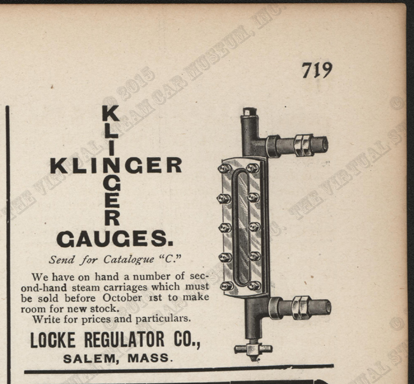 This Locke Regulator COmpany advertisement for its Klinger water level gauges appeared above the White Sewing Machine Company's advertisement for steam Automobiles. The Stearns Company is already abandoning steam in favor of gasoline. Conde Collection. This Locke Regulator Company advertisement featured the Klinger water level gauge. THe advertisement notes that Locke has several second hand steam carriages for sale. Motor World, September 11, 1902, page 719. The Locke Regulator Company published this catalogue of its steam car parts in 1903. 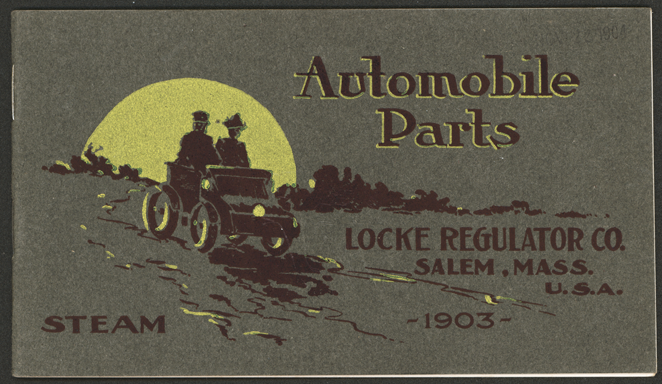 This advertising cover shows a range of the Locke Regulator Company's products in 1908, somewhat after its efforts to build a steam automobile. Georgano, G. N., Encyclopedia of American Automobiles, (New York, E. P. Dutton & Co., 1968), p. 164. 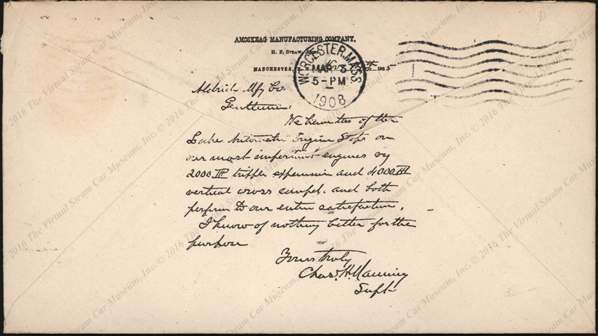 Contact us if you have additional information about the Locke Regulator Company or if you have questions.